NGC 6231 has been one of the discoveries of Giovanni Batista Hodierna, published in his 1654 catalog in Palermo, but forgotten until its rediscovery in the early 1980s. It was independently rediscovered by Edmond Halley in 1678, by Philippe Loys De Chéseaux 1745-46, and by Nicholas Louis de Lacaille in 1751-52. This cluster is extremely young, and was estimated only about 3.2 million years old. Its hottest star is of spectral type O8 and magnitude 4.71, according to the Sky Catalog 2000. It is approaching us at 22 km/sec. It belongs to the Scorpius OB association of very young stars. 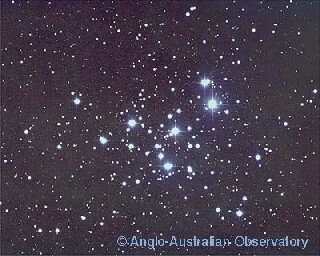 The image in this page was obtained by David Malin with the 3.9-meter Anglo-Australian Telescope. This image is copyrighted and may be used for private purpose only. For any other kind of use, including internet mirroring and storing on CD-ROM, please contact the Photo Permissions Department (photo at aaoepp.aao.gov.au) of the Australian Astronomical Observatory. In John Caldwell's List and in the Astronomical League's Southern Sky Binocular Club List. Caldwell 76 in Patrick Moore's list.